Last night I decided to take advantage of an extra drive in my PC and install the Windows 8 Preview Release and dual-boot with Windows 7. Always a risky proposition with pre-release software, but fortunately I have a Windows Home Server so restoring from a catastrophe would take about 20 minutes. Feeling confident of my ability to live life on the wild side with few consequences, I took the plunge. This isn’t meant to be a full review, packed with screenshots. This is just a basic recap and my impressions. Smooth as silk. I had to burn the ISO to a disk because my Gigabyte MB, while it supports booting from a USB, didn’t see the stick I used to install it on my Acer Iconia Tab. I popped in the freshly burned DVD and was at the setup screen in under 2 minutes. The process up to that point will look familiar to anyone that has setup Windows 7. I was able to choose the New Installation option and format/choose my installation drive as normal. Click Install and your’re off an running. Installation, including reboots, took just under 20 minutes. After the final reboot, installation completed and here’s where things got into new territory. If you have installed one of the Windows 8 previews, this will be completely familiar. With new folks, I think they’ll find the process smooth and intuitive. First up, connecting to a wireless network. It saw all my networks, G/N 2Ghz/N 5Ghz, without issue and I was able to connect in seconds. After that you’re asked whether to go with Express Setup, which is the recommended option, or Custom. Custom lets you set your privacy settings, whether to participate in the Customer Experience Program, etc. I chose Express so simplicity and was on to the next screen. Next you’re asked for your Microsoft ID (formerly Windows Live ID), and your account password. After providing that info and the validation process, you’re at the new Start Screen! I have a nice, 24″ dual monitor setup. What I really liked immediately was that my primary monitor was the new Start Screen and my secondary was the traditional desktop. I was able to quickly fire up IE classic, get all my common sites (Amazon, Twitter, Pandora, etc.) pinned to the taskbar as normal and access the classic control panel via Windows Explorer to setup my power options and other customizations. And aside from having to get more familiar where things were in the new Explorer ribbon, I didn’t have any trouble doing any of this without the classic Start button/menu. Next, I started customizing my new Start Screen. The first problem I ran into was bringing up the Charms bar so I could set some options, like whether to allow for more tiles or access the new Control Panel. With the tablet, a swipe gesture from the left of the screen to the right will bring it up. But there is no such gesture on the PC without a touchscreen monitor. After poking around for a few minutes, I noticed a very small icon on the very lower-right of the screen. I hovered over it with the mouse and bingo! Charms bar. NOTE TO MICROSOFT: This needs to be more intuitive. I am what I would consider a “Power User”. Normal users are going to struggle a lot more than I did and get increasingly frustrated they can’t access it. Now that I was able to access Search, Devices, Settings, etc. via the Charms bar, I moved on to customizing the tiles. The first thing I did at this stage was to go into the Store and install Rowi. 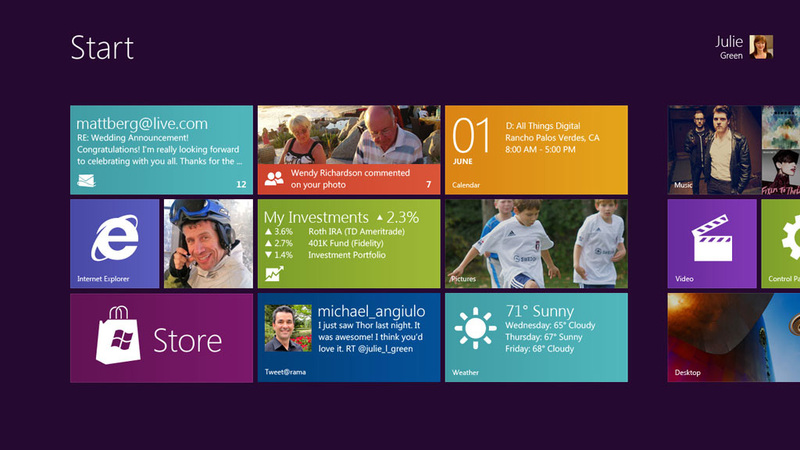 Yes, Rowi for Windows 8 – already. A very pleasant surprise. Setup was easy and I was tweeting in just a minute or so. The installation process is VERY familiar to Windows Phone users. Navigating back to the Start screen, you can see the new app tile with “Installing…” text over it. When the installation is complete, a pleasant alert sound and notification pops up in the upper right of the Start screen. Next, I opened IE Metro and starting pinning my favorites to the Start screen as tiles. Because I didn’t do an upgrade, I had to do all this from scratch. I assume this gets done for you if you upgrade, but I don’t know for sure. I do know that after I did it, I was able to fire up my tablet and, low-and-behold, all my pinned sites from my PC were on the tablet Start screen. Cloud Power! Sync across devices seems to work nicely. By the way, my log in screen image also came to the PC from my tablet, so two way sync works as well. When I got back to the Start screen after pinning my favorites, I also noticed most of my tiles had come to life! People, Pictures, etc. were all animating with the images of my photos and contacts just like on my Windows Phone. Arranging tiles is fairly simple: right-clicking on a tile brings up options. Uninstall, Unpin and the option to make the tile larger or smaller (depending on its current size) pop up from the bottom of the screen. Moving tiles is also easy – just click-hold and drag where you want them. You can divide your tiles into various sections. I have my IE pinned sites in one, my Mail, Music, Messaging and other common tiles in another, and games and other less used items in a third. By organizing everything this way, I found that I didn’t miss the old Start Button/Menu at all! Now I watch TV on my second monitor a lot, while I am coding or doing other things. So Windows Media Center is a must-have. Getting it installed is really simple, as outlined by Paul Thurrot here. Now the bummer is that, while you get a tile for Windows Media Center, it is a “dumb” tile. No animation of any kind and no way to access quick links like Play TV the way you can when it is pinned to the classic task bar. But not to worry, this is again where the classic desktop on the second monitor comes in handy. Just pin it to the taskbar there and it works the same way it does in Windows 7. So far, it looks like the release preview is very stable. However, my nVidia GeForce GTX 460 drivers keep causing crashes. Viewing TV in Media Center seems to increase the instability quite a bit. However, I can’t tell how much of this is isolated to Windows 8 being a beta, since I frequently have the exact same problem in Windows 7, albeit much less frequently. For this reason alone, so far, I won’t be able to use Windows 8 as my primary OS until nVidia gets some better drivers out. As for responsiveness, again, very smooth and fluid, with the exception of a few of the built-in apps like Music and the Store. Could be network related, but there was a significant amount of stuttering, making the experience much less fluid than when interacting with the OS itself. I love the flattening out of the windows and ribbon as well as the updated iconography and coloring in the classic OS. Very Metro and visually appealing. I think they have some more tweaking to do, though, to ensure more consistency. All in-all, very nice. I love it, so far. After reading all the extreme bitching by commenters on sites like Neowin about the removal of the Start Button/Menu, I can only say how about you actually spend some quality time with Windows 8 before judging. For me, I loved the new Start screen tiles coming alive with all my stuff, just like on Windows Phone. And having the taskbar stretch across both monitors so I could easily access classic tasks on the second was something I very quickly found myself getting used to. One thing that is annoying, when I access anything on the classic desktop on the second monitor, the primary monitor flips to classic desktop too. I’d like the ability to turn that behavior on and off. For me, I’d prefer my primary monitor stay locked on the new Start Screen unless I explicity use the Desktop tile there to open classic desktop. It is clear Microsoft is trying very hard to strike just the right balance between old and new to make their “3 screens and a cloud” vision come to fruition without causing confusion and angst with users. They still have some work to do, and this build is probably many behind what they are currently working on. That portends the chance for some nice surprises when Windows 8 hits RTM later this year. Once I get some stable video drivers, I’ll be switching over to Windows 8 Release Preview as my daily OS. I can’t wait to get hooked. I’m nearly there already.